Discussion in 'The Americas' started by SvenSvensonov, Feb 18, 2017. A thread dedicated to the US Space program past, present and future. Pictures, news, commercial, military... all that good stuff. Occasionally I may also throw in some non-space NASA programs like airborne research or X-planes. Scientists and engineers had many challenges in designing the components of NASA's James Webb Space Telescope and then had to custom design and build ways to test it. NASA engineers and technicians perform vibration testing on the James Webb Space Telescope. Because of the sheer size and scale of the assembled Webb telescope, some of the equipment typically used to test spacecraft simply doesn’t measure up. One of those is a "shaker table" that is used to shake satellites to ensure a spacecraft like Webb can withstand the shaking that comes with a ride into space on a rocket. So, engineers at Team Corporation in Burlington, Washington built a new, large and advanced shaker table system at NASA's Goddard Space Flight Center in Greenbelt, Maryland, especially for testing Webb. "The new “Vibration Test Systems” simulates the forces the telescope will feel during the launch by vibrating it from 5 to 100 times per second" said Jon Lawrence, Webb telescope mechanical systems lead and launch vehicle liaison at NASA's Goddard Space Flight Center. The specially-constructed shaker table at NASA's Goddard Space Flight Center in Greenbelt, Md. during its construction. This view only shows the horizontal shaker, as the vertical hadn’t been installed yet. For Webb, the need for a new shaker system was a combination of things, including shaker force magnitude, the shaker table’s ability to handle the telescope’s highly offset center of gravity, and the need for a precision “smart” shaker control system—one that will automatically adjust shaker input levels based on test article responses, including an automatic ‘soft shutdown’ capability. "No matter what facility anomaly might be experienced during testing (loss of power, loss of coolant, etc. ), the Vibration Test System or VTS is designed to shut down 'softly' so as to avoid imparting potentially damaging loads," Lawrence said. After vibration testing of the telescope is completed soon, the new VTS can be used to test other future large spacecraft. To make sure it works properly before using it to test the flight telescope, engineers put the new shaker system though its paces with many practice runs over months, using a dummy mass to represent the telescope. 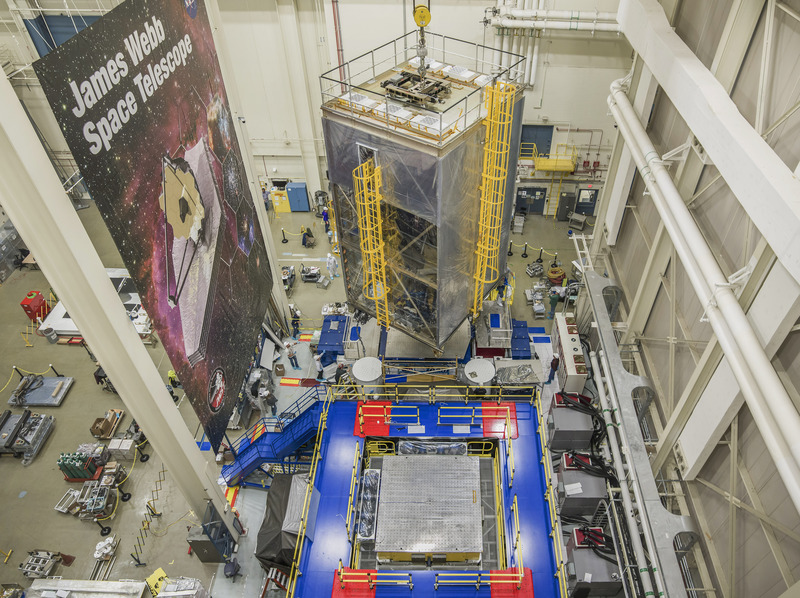 In November, Webb was moved from the Spacecraft Systems Development and Integration Facility ‘cleanroom’ and onto the new neighboring Vibration Test System (VTS), where testing is ongoing. 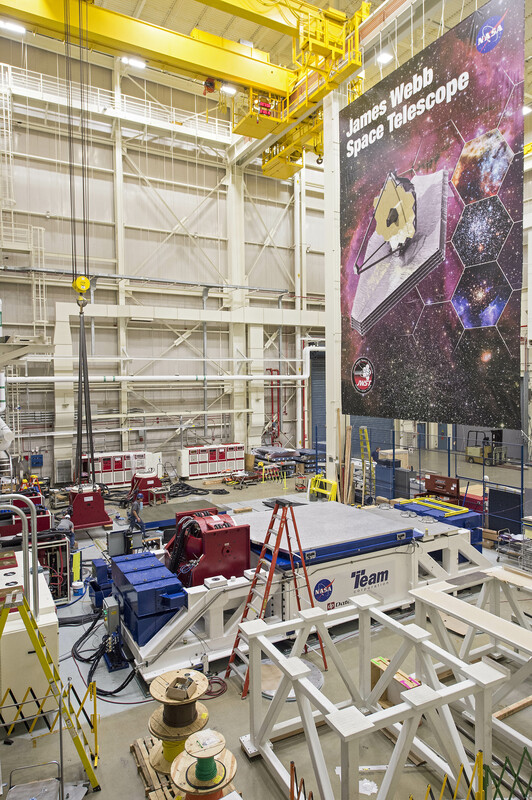 While in the shirtsleeve environment of the VTS, a large 3-story tall cover enshrouds the telescope, acting as a portable ‘cleanroom’ that protects it from dust and dirt. This spring, after vibration testing is complete, the Webb telescope will be shipped to NASA's Johnson Space Center in Houston, Texas, for end-to-end optical tests in a vacuum at extremely cold temperatures, before it goes to Northrop Grumman Aerospace Systems in Redondo Beach, California, for final assembly and testing prior to launch. A short featurette about how engineers at Goddard Space Flight Center in Greenbelt, Maryland practice moving a mock up version of the James Webb Space Telescope onto the vibration facility, before moving the actual telescope for sine vibration tests. Inactive, Itachi, PARIKRAMA and 5 others like this. Inactive, anant_s, PARIKRAMA and 1 other person like this. NASA's B̶a̶l̶l̶o̶o̶n̶ Swamp Gas Program Returns to Wanaka, New Zealand . For a third consecutive year, NASA is returning to Wanaka, New Zealand, to launch a long-duration, heavy-lift super pressure balloon (SPB) into one of the most dynamic and severe flight regimes inside the Earth's atmosphere. After launch, planned for the late March/early April timeframe, the 18.8-million-cubic-foot (532,000 cubic-meter) SPB will ascend to an altitude of 110,000 feet (33.5 km) where the stratospheric winds will propel it at speeds up to and exceeding 100 knots through the heating and cooling of the day-night cycle on a weeks-long journey around the southern hemisphere. Henry Cathey, super pressure balloon engineer, talks with residents of Wanaka, New Zealand, about the super pressure balloon capability during an outreach event in 2016. 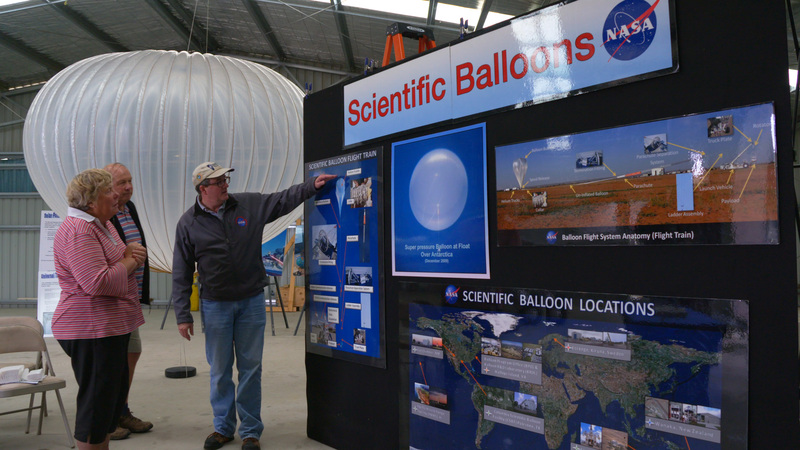 NASA will conduct a number of outreach events in New Zealand when the Balloon Program returns to Wanaka for its 2017 campaign. 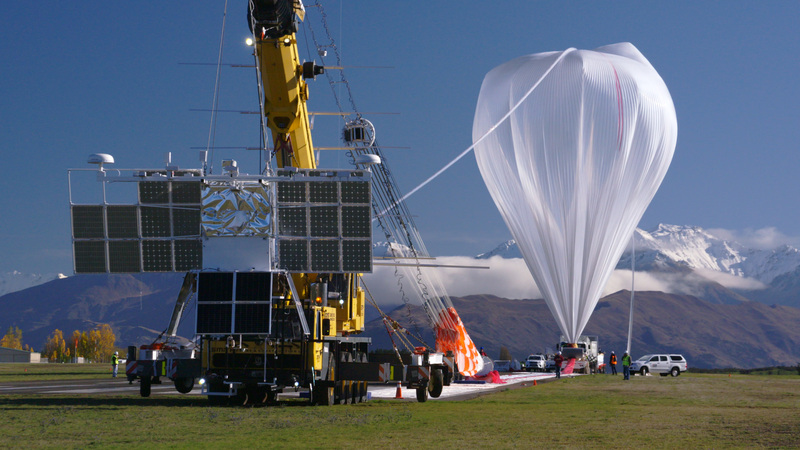 "We are excited to return to Wanaka, which has served as an ideal location for launching our SPB test flights," said Debbie Fairbrother, NASA's Balloon Program Office chief. "With 32 days of flight in 2015 and 46 days in 2016, we hope to build on the successes and lessons learned of our past campaigns as we seek even longer duration flights at mid-latitudes." NASA's Super Pressure Balloon (SPB) fully inflated and flying at 110,000 feet as seen from the balloon gondola looking up. While the ongoing testing and development of the SPB is the primary focus of this year's mission, the NASA Scientific Balloon Team is flying the University of Chicago's Extreme Universe Space Observatory (EUSO-SPB) payload as a mission of opportunity. The EUSO-SPB team’s arrival in Wanaka will coincide with the CSBF team arrival. "Along with providing a low-cost alternative for certain types of science payloads that otherwise would need to launch into orbit around the Earth, NASA's scientific balloons also support technology demonstrations, like EUSO-SPB, as a means to validate the technologies in an environment similar to space," said Fairbrother. New to the 2017 campaign will be the much-anticipated construction of a dedicated balloon launch pad on the northeast side of the Wanaka Airport. This new pad, a 600-metre in diameter large gravel semi-circle, will enable NASA's balloon launch operations to run seamlessly alongside other airport operations and tenants on launch day. 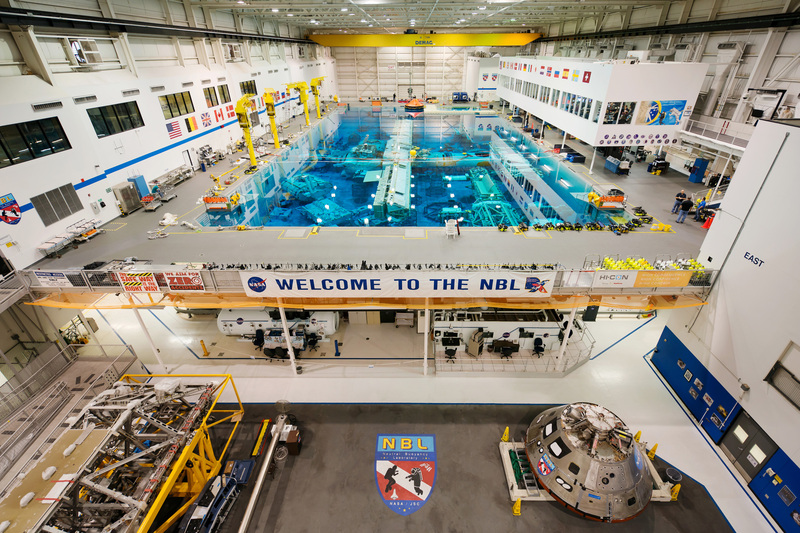 NASA will still operate out of a leased hangar onsite. NASA's SPB is a large structure, about the size of the Forsyth-Barr Stadium in Dunedin, New Zealand, when fully inflated. The balloon is made from polyethylene film, which is similar in appearance and thickness to the type used for sandwich bags, but stronger and more durable. As a pressurized flight vehicle, the SPB is designed to float at a constant density altitude despite the heating and cooling of the day-night cycle. This pressurization, coupled with the stratospheric conditions in the southern hemisphere, enable long-duration flights. 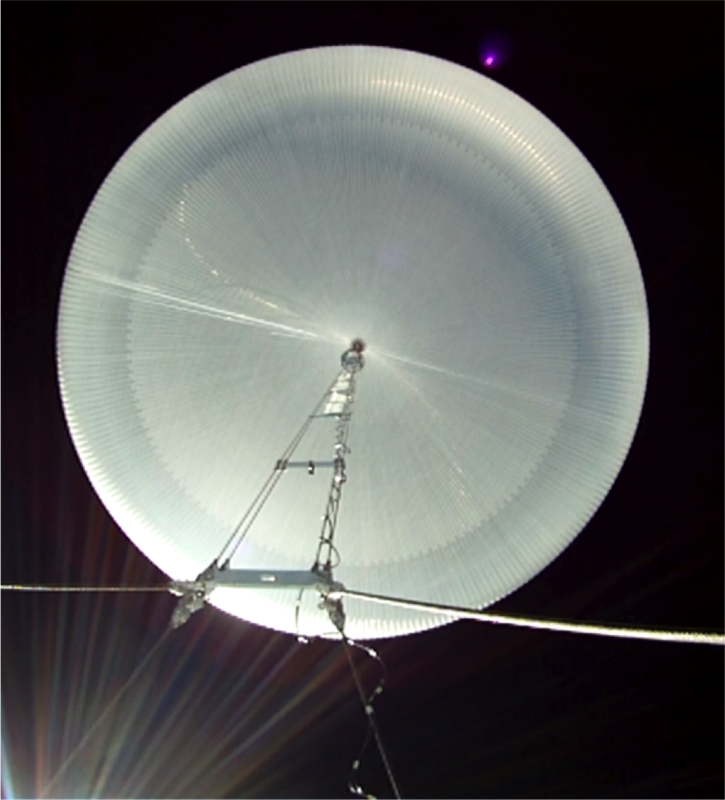 The science and engineering communities have previously identified long-duration balloon flights at constant altitudes as playing an important role in providing inexpensive access to the near-space environment for science and technology. The current record for a NASA super pressure balloon flight is 54 days. Inactive, PARIKRAMA, GSLV Mk III and 2 others like this. The Tracking and Data Relay Satellite (TDRS) project has begun final testing on a new satellite that will replenish NASA's Space Network. The spacecraft is scheduled to launch from NASA’s Kennedy Space Center in Cape Canaveral, Florida, on Aug. 3, 2017, on an Atlas V rocket. The addition of TDRS-M to the fleet will provide the Space Network (SN) the ability to support space communication for an additional 15 years. The network consists of TDRS satellites that transmit data to and from ground stations on Earth for NASA missions and expendable launch vehicles. Without the Space Network, scientists, engineers and control room staff would be unable to readily access data from missions like the Hubble Space Telescope and the International Space Station. TDRS-M will enable groundbreaking science and expand the current fleet of satellites. TDRS puts the "space" in Space Network. In geosynchronous orbit around Earth, the TDRS constellation ensures reliable, global communications coverage to more than 35 NASA spacecraft. TDRS-M will be the 12th satellite the TDRS team has launched since 1983. Designed, built and environmentally tested at Boeing’s satellite development center in El Segundo, California, the spacecraft is currently undergoing a final series of tests to ensure it is flight-ready. TDRS-M will continue to undergo electronics, compatibility and deployment tests into the spring as the team prepares to ship the spacecraft to NASA’s Kennedy Space Center in Cape Canaveral, Florida, for its mid-summer launch. Engineers deployed TDRS-M’s antennas during a routine test at Boeing’s plant in El Segundo, California. NASA developed the idea for the Space Network in the 1970s to improve upon the ground-based space communications networks the agency had used since its inception. With ground networks, spacecraft could only connect with the antennas for short periods of time while they were in sight of the ground terminal. Then they would be without a communications connection for long periods of time. By contrast, a space-based network with satellites placed around the globe would provide nearly continuous coverage. 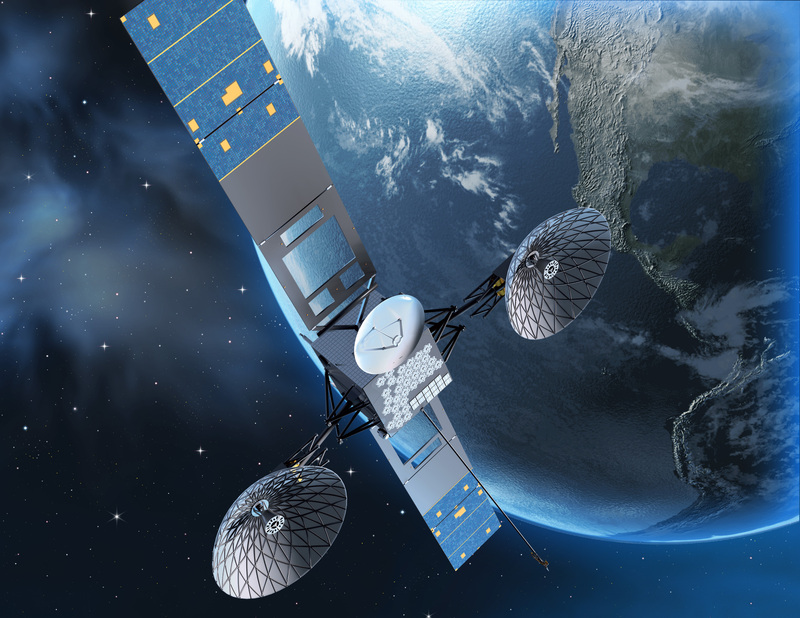 Artist’s concept of the third-generation TDRS spacecraft. In coming months, engineers will test TDRS-M to ensure it connects with the Space Network’s various ground stations. NASA built the initial White Sands Ground Terminal (WSGT) in Las Cruces, New Mexico, in the 1970s and launched the first TDRS in 1983. In the 1980s, NASA identified the need for and built the Second TDRS Ground Terminal (STGT) at White Sands, forming the White Sands Complex. Today, the network has added two additional ground terminals in Guam and Blossom Point, Maryland, and currently has nine TDRS in orbit around Earth. Two of the original spacecraft have now been retired. The two most recent satellites, TDRS-K and TDRS-L, were launched from Kennedy Space Center to replenish the fleet in January 2013 and January 2014, respectively. After the scheduled TDRS-M launch later this year, the TDRS project will have successfully launched 12 satellites in support of the Space Network. The TDRS project at NASA’s Goddard Space Flight Center is responsible for the design, build, integration and testing of the spacecraft. After launch, on-orbit testing and spacecraft acceptance by the TDRS project, the Space Network will integrate TDRS-M into the TDRS constellation. The TDRS project office at Goddard Space Flight Center manages the development effort in conjunction with the Space Communications and Navigation (SCaN) office within the Human Exploration and Operations (HEO) Mission Directorate at NASA Headquarters in Washington. Inactive, PARIKRAMA and Gessler like this. An excellent thread! We've had news of important NASA developments but they were few and far between owing to the lack of general interest/awareness in ongoing US space programs on the forum. This thread and Sven's contribution should change that. NASA provider SpaceX's Falcon 9 rocket and Dragon spacecraft are vertical at Launch Complex 39A at NASA’s Kennedy Space Center in Florida. Liftoff of SpaceX's tenth Commercial Resupply Services cargo mission to the International Space Station is scheduled for 10:01 a.m. EST on Saturday, Feb. 18, 2017. The mission will set a milestone as the first launch from Launch Complex 39A since the space shuttle fleet retired in 2011. It will mark a turning point for Kennedy's transition to a multi-user spaceport geared to support public and private missions, as well as those conducted in partnership with NASA. Dragon will carry science research, crew supplies and hardware to the orbiting laboratory in support of the Expedition 50 and 51 crew members. Research highlights aboard Dragon include the Lightning Imaging Sensor (LIS), a space-based instrument measuring the amount, rate and energy of lightning as it strikes around the world; the Raven investigation studying a real-time spacecraft navigation system; and the Stratospheric Aerosol and Gas Experiment (SAGE) III instrument measuring stratospheric ozone, aerosols, and other trace gases by locking onto the sun or moon and scanning a thin profile of Earth's atmosphere. The launch was scrubbed. Sunday 2:19:17 has been proposed as the next viable launch date. 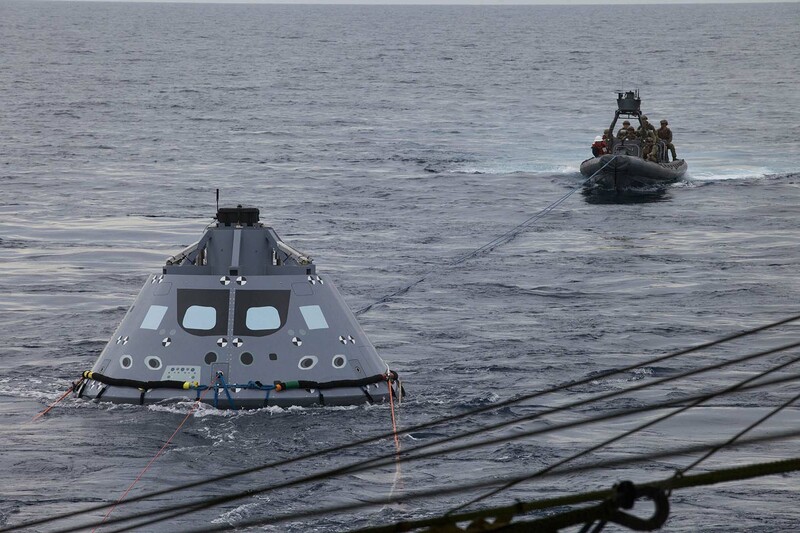 U.S. Navy divers and other personnel in a rigid hull Zodiac boat have attached tether lines to a test version of the Orion crew module during Underway Recovery Test 5 in the Pacific Ocean off the coast of California on Oct. 27, 2016. NASA's Ground Systems Development and Operations Program and the U.S. Navy are conducting a series of tests using the USS San Diego, various watercraft and equipment to practice for recovery of Orion on its return from deep space missions. The testing will allow the team to demonstrate and evaluate recovery processes, procedures, hardware and personnel in open waters. Orion is the exploration spacecraft designed to carry astronauts to destinations not yet explored by humans, including an asteroid and NASA's Journey to Mars. It will have emergency abort capability, sustain the crew during space travel and provide safe re-entry from deep space return velocities. Orion is scheduled to launch on NASA's Space Launch System in late 2018. Expedition 50 Commander Shane Kimbrough of NASA at work outside the International Space Station on Jan. 13, 2017, in a photo taken by fellow spacewalker Thomas Pesquet of the European Space Agency. 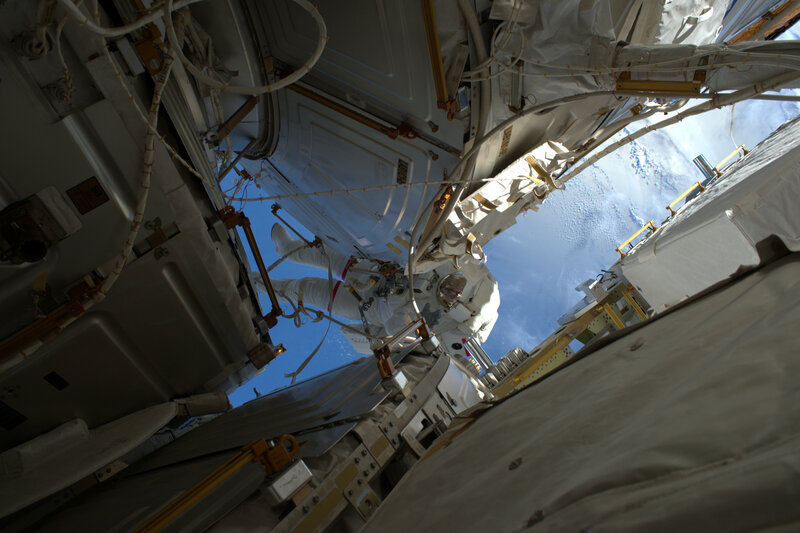 During the nearly six-hour spacewalk, the two astronauts successfully installed three new adapter plates and hooked up electrical connections for three of the six new lithium-ion batteries on the International Space Station. This was the second spacewalk in a week for Kimbrough and the fourth of his career, and the first for Pesquet. To date, space station crew members have conducted 197 spacewalks in support of assembly and maintenance of the orbiting laboratory. Spacewalkers have now spent a total of 51 days 6 hours and 4 minutes working outside the station. In an effort to improve fuel efficiency, NASA and the aircraft industry are rethinking aircraft design. 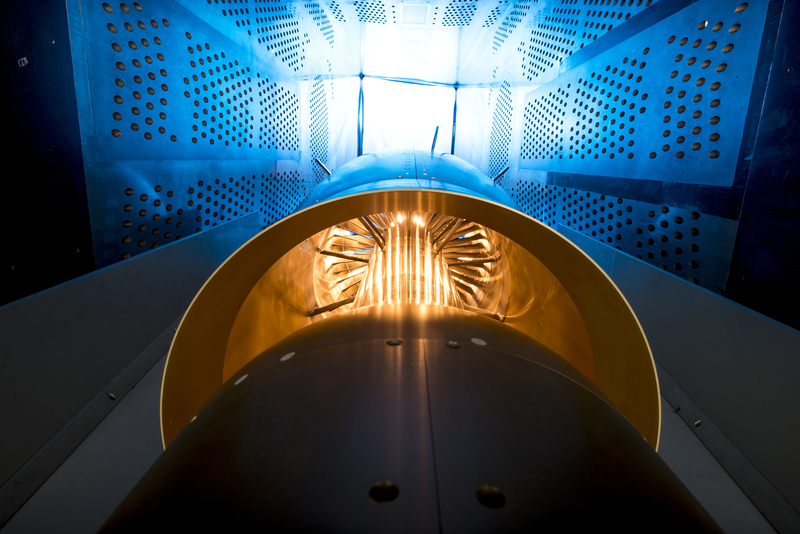 Inside the 8’ x 6’ wind tunnel at NASA Glenn, engineers recently tested a fan and inlet design, commonly called a propulsor, which could use four to eight percent less fuel than today’s advanced aircraft. The new propulsor is designed to be embedded in the aircraft’s body, where it would ingest the slower flowing air that normally develops along an aircraft’s surface, called boundary layer, and use it to help propel the aircraft. The tests showed that the new fan and inlet design could withstand the turbulent boundary layer airflow and increase efficiency. Results of the tests can be applied to cutting-edge aircraft designs that NASA and its partners are pursuing. When you need to test hardware designed to operate in the vast reaches of space, you start in a vacuum chamber. NASA’s Glenn Research Center in Cleveland has many of them, but Vacuum Chamber 5 (VF-5) is special. 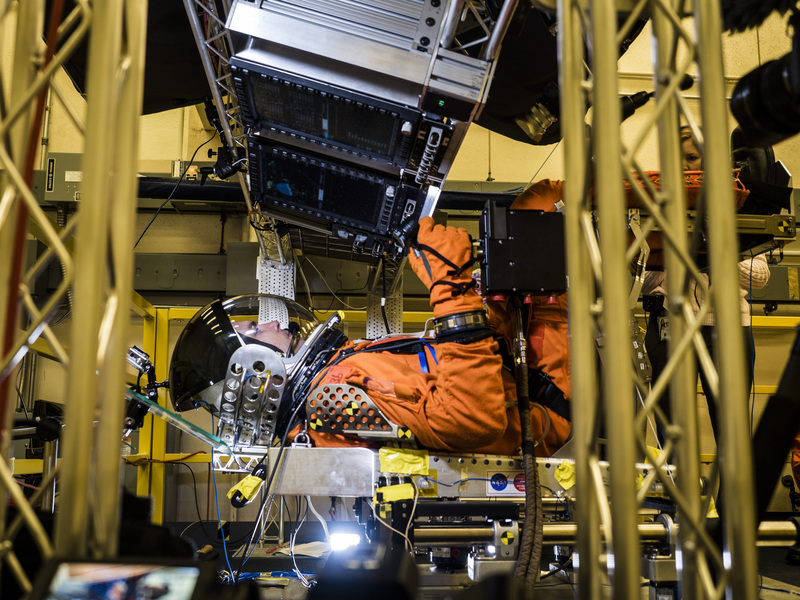 Supporting the testing of electric propulsion and power systems, VF-5 has the highest pumping speed of any electric propulsion test facility in the world, which is important in maintaining a continuous space-like environment. The cryogenic panels at the top and back of the chamber house a helium-cooled panel that reaches near absolute zero temperatures (about -440 degrees Fahrenheit). 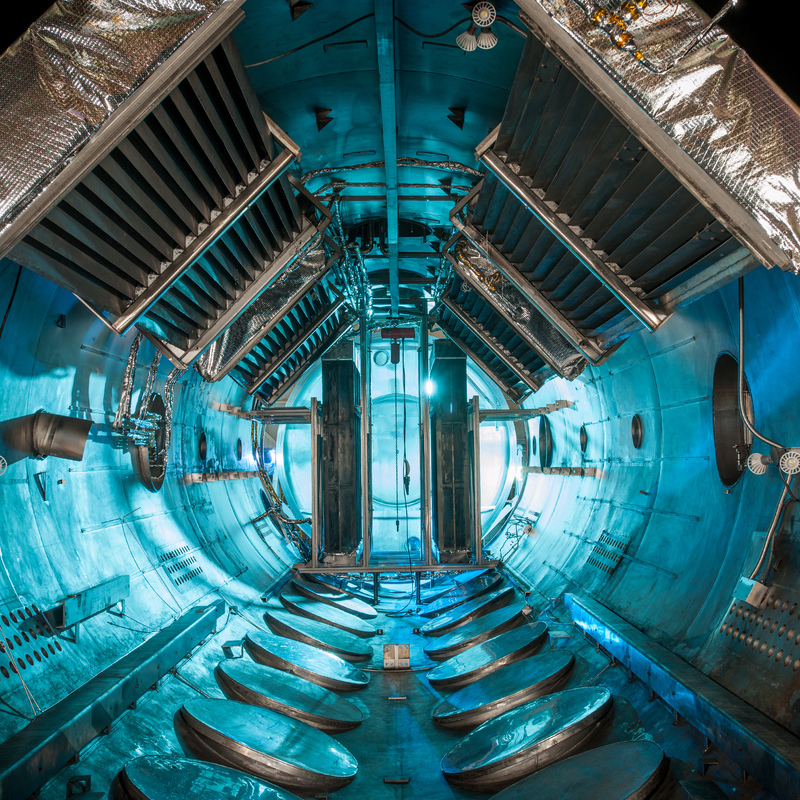 The extreme cold of this panel freezes any air left in the chamber and quickly freezes the thruster exhaust, allowing the chamber to maintain a high vacuum environment. The outer chevrons are cooled with liquid nitrogen to shield the cryogenic panels from the room temperature surfaces of the tank. Most electric propulsion devices, such as Hall Thrusters, use xenon as a propellant, which is very expensive. 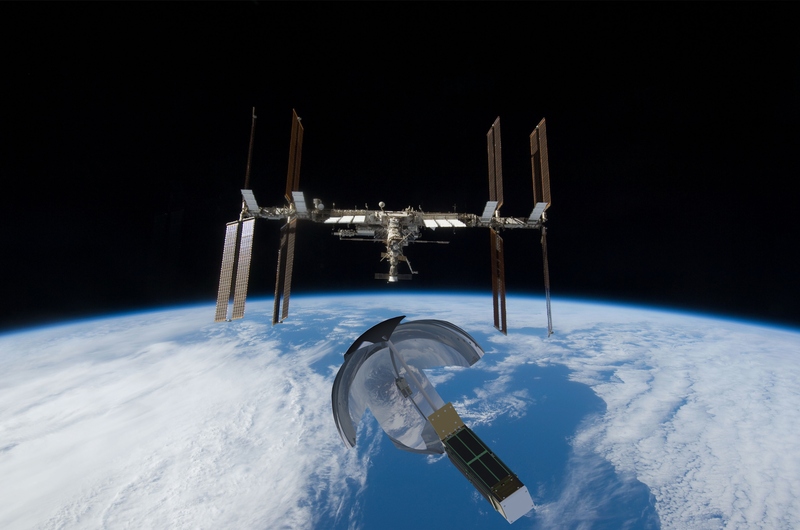 By capturing the used xenon as ice during testing, researchers are able to recover the propellant to reuse, saving NASA and test customers considerable costs. The oil diffusion pumps along the bottom of the tank capped by circular covers use a low vapor pressure silicon oil to concentrate small amounts of gas to the point where it can be mechanically pumped from the chamber. VF-5 will continue to provide a testing environment for Glenn’s advanced Solar Electric Propulsion technology needed for future astronaut expeditions into deep space, including to Mars. Inactive, PARIKRAMA, Dagger and 1 other person like this. NASA’s “Exo-Brake” will demonstrate a critical technology leading to the potential return of science payloads to Earth from the International Space Station through the deployment of small spacecraft in early 2017. An Exo-Brake is a tension-based, flexible braking device resembling a cross-parachute that deploys from the rear of a satellite to increase the drag. It is a de-orbit device that replaces the more complicated rocket-based systems that would normally be employed during the de-orbit phase of re-entry. “The Exo-Brake’s current design uses a hybrid system of mechanical struts and flexible cord with a control system that ‘warps’ the Exo-Brake – much like how the Wright brothers used warping to control the flight behavior of their first wing design,” said Marcus Murbach, principal investigator and inventor of the Exobrake device. Engineers at NASA’s Ames Research Center in California’s Silicon Valley, have been testing the Exo-Brake technology as a simple design that promises to help bring small payloads back through Earth’s atmosphere unharmed. The technology demonstration mission is a part of the Technology Education (TechEdSat-5) nanosatellite that was launched Dec. 9 on Japan’s H-II Transfer Vehicle from Tanegashima Space Center in Japan. The Exo-Brake will reside on the space station until its deployment in early 2017. 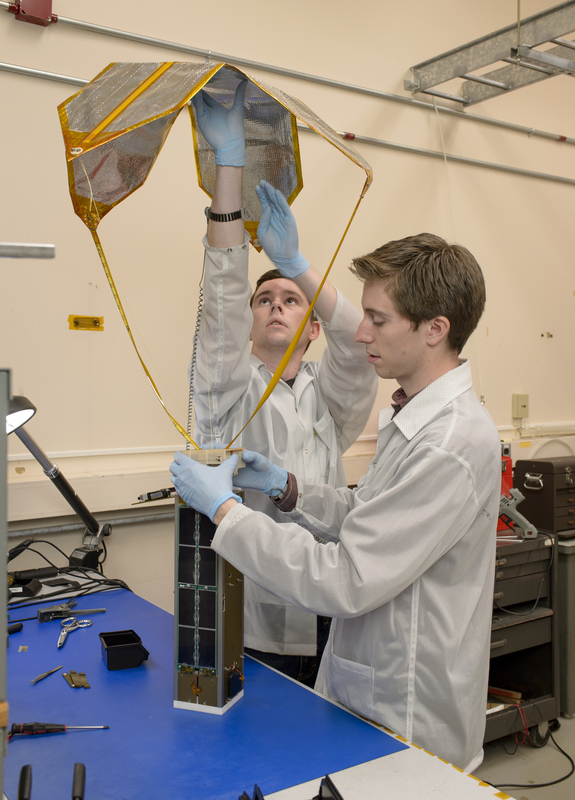 Engineers pack the Technology Education Satellite (TechEdSat-5) with the Exo-Brake payload. At almost 4 square feet in cross section (0.35 square meters), the Exo-Brake is made of Mylar and is controlled by a hybrid system of mechanic struts and flexible cord. Since 2012, the Exo-Brake has been tested on balloons and sub-orbital rockets through the Sub-Orbital Aerodynamic Re-entry Experiments, or SOAREX, flight series. Earlier versions of the Exo-Brake and other critical systems also have been tested on orbital experiments on TechEdSat nano-satellite missions. Two additional technologies will be demonstrated on TechEdSat-5. These include the ‘Cricket’ Wireless Sensor Module (WSM), which provides a unique wireless network for multiple wireless sensors, providing real time data for TechEdSat-5. TechEdSat-5’s nanosatellite bus element will also utilize the PhoneSat-5 avionics board that uses, for the first time, the versatile Intel Edison microprocessor. The new board is designed to test TechEdSat-5’s unique Wi-Fi capabilities, high fidelity cameras, and contains Iridium L-band transceiver for data. In addition to the goal of returning samples from the space station, the project seeks to develop “building blocks” for larger scale systems that might enable future small or nanosatellite missions to reach the surface of Mars and other planetary bodies in the solar system. The Exo-Brake is funded by the Entry Systems Modeling project within the Space Technology Mission Directorate’s Game Changing Development program. Additional funding for the Exo-Brake is provided by NASA Ames Research Center and the NASA Engineering and Safety Center. The TechEdSat series of nanosatellites is a STEM collaborative activity that involves NASA early-career employees, interns and students from several universities including San Jose State University, University of Idaho, University of California at Riverside, and California Polytechnic San Luis Obispo. PARIKRAMA, Agent_47, Dagger and 1 other person like this. The Indian space agency and US Nasa's Jet Propulsion Laboratory are jointly working on the development of Dual Frequency (L&S band) Synthetic Aperture Radar (SAR) Imaging Satellite named as Nasa-Isro Synthetic Aperture Radar (Nisar), slated to be completed and launched by 2021, parliament was told on Thursday. The Indian Space Research Organisation (Isro) will be responsible for design and development of S-band SAR, Spacecraft Bus, data transmission system, spacecraft integration and testing, launch using heavy rocket geosynchronous satellite launch vehicle (GSLV) and on-orbit operations, Minister of State in the PMO Jitendra Singh, who also holds charge of the Space Department, told the Rajya Sabha in a written reply. The Nasa laboratory will be responsible for design and development of L-band SAR, 12m unfurlable antenna and its deployment elements, global positioning system (GPS) and data recorder. The L and S band microwave data obtained from this satellite will be useful for variety of applications, which include natural resources mapping & monitoring; estimating agricultural biomass over full duration of crop cycle; assessing soil moisture; monitoring of floods and oil slicks; coastal erosion, coastline changes and variation of winds in coastal waters; assessment of mangroves; surface deformation studies and others. Isro and JPL/ Nasa are working towards realisation of this mission by 2021 and both agencies have obtained necessary approvals from respective governments, he said. The joint science observation plan has been documented with the participation of Indian and American scientists. The core science teams of India and US meet every six months to discuss various observation requirements and strategies of science observation. The technical teams of both the agencies are working towards building the necessary systems, Singh said. PARIKRAMA, GSLV Mk III, Agent_47 and 1 other person like this. Do not worry. The people on this forum are all in for space stuff - but more so for Indian space stuff! I'm sure interest in space research goes beyond earthly boundaries - all that's needed is a thread like this and a person like you to keep a constant stream of info coming in...much appreciated. Be sure to cover SpaceX and other private-sector companies as well. We're very much interested! PARIKRAMA and Dagger like this. 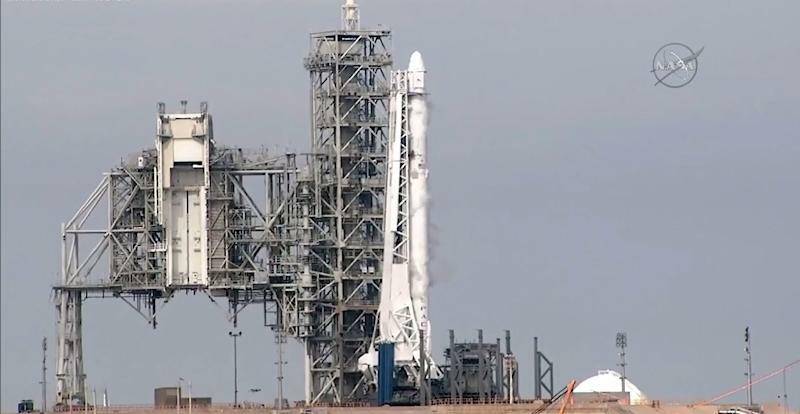 Miami (AFP) - SpaceX aborted its planned Dragon cargo launch to the International Space Station just seconds before liftoff Saturday due to a "slightly odd" technical issue with the Falcon 9 rocket engine. The delay was taken "out of an abundance of caution," a SpaceX spokesman said, and came a day after engineers discovered a small helium leak in the engine's second stage. "All systems go, except the movement trace of an upper stage engine steering hydraulic piston was slightly odd," SpaceX chief executive officer Elon Musk said on Twitter after the launch was scrubbed. "Standing down to investigate," he added. "If this is the only issue, flight would be fine, but need to make sure that it isn't symptomatic of a more significant upstream root cause." The next launch attempt is scheduled for 9:38 am Sunday (1438 GMT). In the meantime, engineers plan to "take a closer look at the position of the second stage engine nozzle," SpaceX said. The Hawthorne, California-based company has endured two costly disasters in the past two years -- a launchpad blast that destroyed a rocket and its satellite payload in September, and a June 2015 explosion after liftoff that obliterated a Dragon cargo ship packed with provisions bound for the space station. SpaceX has since made one successful return to flight in January of this year, from Vandenberg Air Force base in California. But this flight is particularly significant because of its starting point at Cape Canaveral's launchpad 39A, which was used for the pioneering Apollo missions to the Moon in the 1960s and 1970s, and later for the space shuttle launches from 1981 to 2011. SpaceX negotiated a lease for the launchpad with NASA in 2013, beating out its competitor Blue Origin, headed by Amazon founder Jeff Bezos. By the time the launchpad is completely outfitted for sending astronauts to space in 2018, the company will have spent over $100 million to adapt it for modern day spaceflights, SpaceX chief operating officer Gwynne Shotwell said. 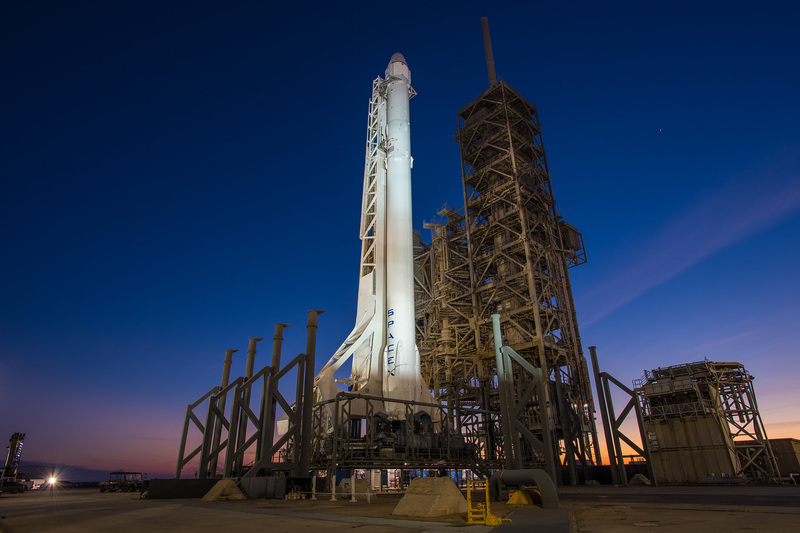 The current cargo resupply mission, known as CRS-10, is the 10th of up to 20 planned trips to the space station as part of a contract between SpaceX and NASA. 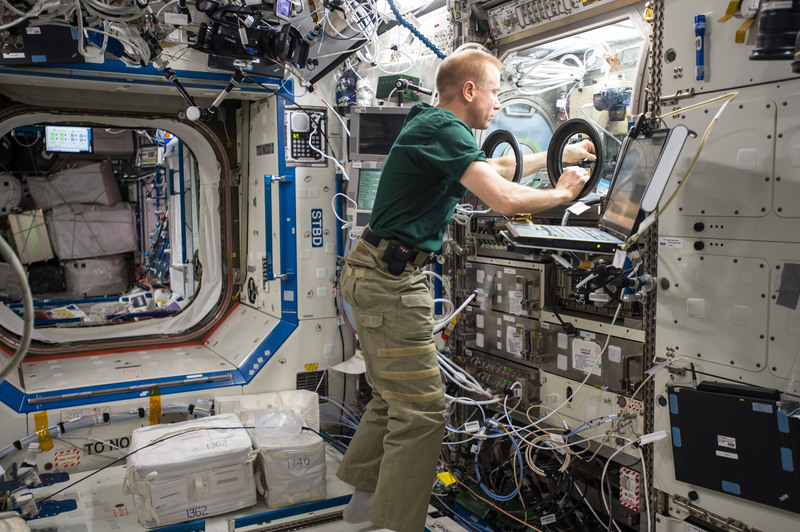 The unmanned spaceship is packed with more than 5,000 pounds (2,267 kilograms) of food, gear and science experiments for the astronauts living in orbit. The weather forecast for Sunday is 70 percent favorable for liftoff. Following the launch, SpaceX plans to try landing the booster on solid ground at a different part of Cape Canaveral. If successful, the upright touchdown of the Falcon 9's first stage would mark the third time SpaceX has managed to stick a landing on solid ground. Other such landings have taken place on floating ocean platforms, as the company perfects its techniques of powering costly rocket parts back to land instead of jettisoning them in the ocean after a single use. Schwifty and Agent_47 like this. The low-cost commercial foreign satellite launch services of the Indian Space Research Organisation (ISRO) are poised to take a severe beating at the hands of Elon Musk's Space Exploration Technologies Corporation (SpaceX) fly-back rockets, the Falcon 9 series. SpaceX, headquartered in Hawthorne, California, has developed a technology of soft-landing its rocket's first stage at a predetermined location after a satellite launch, reassembling that with a second stage, refuelling and sending the assembled rocket on a second launch mission into space within hours of the previous one. Conventional launches by the Bengaluru-headquartered ISRO and other space agencies not only add to the cost of readying a new launcher, but also the time taken for the next launch. According to Musk, as well as space experts, SpaceX's concept - which is being successfully tested - can drastically cut spaceflight costs "by a factor of 100", making the company a low-cost game-changer in the satellite market. ISRO gained popularity for its 100% successful foreign satellite launches using the polar satellite launch vehicle (PSLV) rockets, charging just 60% of the fees charged by foreign space agencies such as Arianespace. Since May 1999, it has successfully launched 57 international customer satellites from 20 countries on board the PSLV. ISRO's global client list includes EADS Astrium, Intelsat, Avanti Group, WorldSpace, Inmarsat, World Sat, DLR, KARI, Eutelsat and several other space institutions across Europe, West Asia and South-East Asia. But all that is likely to change. Former National Aerospace Laboratories director and the longest serving member (resigned in 2012) of the Indian space commission, Prof Roddam Narasimha said, "At least for some time, ISRO will not be affected. 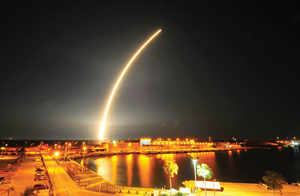 But what SpaceX is doing will eventually drastically reduce launch costs." He said India's PSLV launcher, which has been a complete success, will continue to hold sway for at least "some time to come" as SpaceX is yet to perfect its technologies. "But I also feel ISRO is not utilising its global launch market properly. They have to do more," he said. plane had to be used after each flight, what impact it would have on the cost of each flight! So, reusability is the future of launch technologies if one were to look at reducing costs." Rao, however, felt the major significance of SpaceX technologies would be for long-duration space flights. But SpaceX already has about 70 launches in its kitty worth $10 billion in contracts. These include commercial satellite launches (which ISRO does) and missions for NASA under a $1.6 billion contract to fly a series of 12 cargo resupply missions to the International Space Station, besides carrying crew. In August 2014, ISRO's customer Eutelsat (the third largest fixed satellite services operator in the world) planned to spend about 100 million (about Rs 760.29 crore) lesser per year till 2017 and preferred SpaceX over ISRO. ISRO does have its own Reusable Launch Vehicle (RLV), the technology demonstrator of which is to be tested later this month. But ISRO's RLV is similar to US' space shuttle, in which the reusable component - the 1.5 tonne winged spacecraft - lifts off vertically, powered by a rocket, then separates from the rocket to release the payload into the orbit and return to earth to land like an aircraft on a runway. The main rocket, however, is wasted, unlike in SpaceX's launches, adding to costs. With the RLV, ISRO is expecting to bring down the cost per launch from the current $5,000 (about Rs 3.33 lakh) per kg to $500 (Rs 33,305) per kg of payload charged to customers. But the project (called Avatar), is expected to take another nine years to complete. By this time, experts believe, SpaceX's already proven technology would have made inroads in the global satellite launch market, impacting ISRO's prospects. Be sure to cover SpaceX and other private-sector companies as well. Ah yes, good point. SpaceX is the most prolific followed by Blue Origins, but they aren't the only players in the game either. Small satellite launch company Rocket Lab is getting ready for launch. The company announced today that the first of its Electron rockets has arrived at its launch complex in New Zealand. Its arrival commences a series of test items that need to be crossed off before the company embarks on its first test flight. The rocket, dubbed It's A Test will be the first of three rockets the company plans to launch to orbit before beginning its commercial launches for customers. If successful, these will also be the first rockets launched to orbit from New Zealand. Rocket Lab's approach to building rockets is a unique one. While most rockets are built by hand, Rocket Lab's approach is mass production of rockets. The Electron is composed of carbon composites that are both lightweight and strong. The rocket's engine is primarily constructed with 3D-printed components and can be put together in a few days. The combination of materials, scale and method enables to company to offer low prices on launch for its customers. "Through the innovative use of new technologies our team has created a launch vehicle designed for manufacture at unprecedented scale," said Peter Beck, Rocket Lab's CEO in a statement. "Our ultimate goal is to change our ability to access space." PARIKRAMA, Schwifty and Gessler like this. A United Launch Alliance Atlas V rocket thundered off from Cape Canaveral Friday night, carrying into orbit a critical missile warning satellite for the U.S. defense forces to keep watch over potentially dangerous missile launches affecting the U.S. homeland and forces stationed abroad. 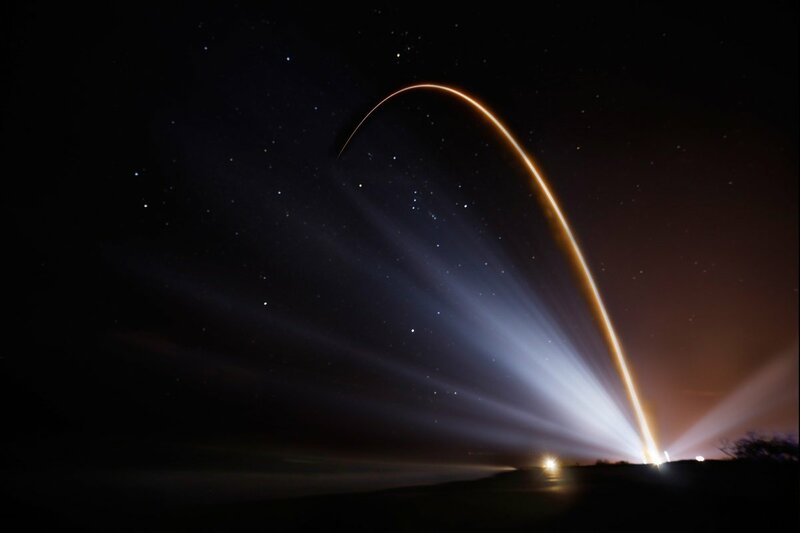 The 59-meter tall Atlas V rocket lit up the dark skies over Florida’s space coast at 7:42 p.m. local time, 0:42 UTC on Saturday, departing to the east-south-east to take into orbit the $1.2 billion SBIRS-GEO 3 satellite to join what is considered the Pentagon’s most important satellite program, enabling global missile detection and cutting in half warning lead times over the previous system. Atlas V powered away from Cape Canaveral under the loud thunder of its Russian-built RD-180 engine, passing the speed of sound 80 seconds into the mission. The first stage dropped away just after the four-minute mark into the night’s mission, handing powered flight duties over to the trusted Centaur upper stage that was tasked with a pair of firings of its vacuum-optimized engine. Centaur first placed the stack into a preliminary parking orbit before lighting up again when passing over Africa to lift the 4.5-metric ton SBIRS satellite into a standard Geostationary Transfer Orbit peaking nearly 36,000 Kilometers above the equator. 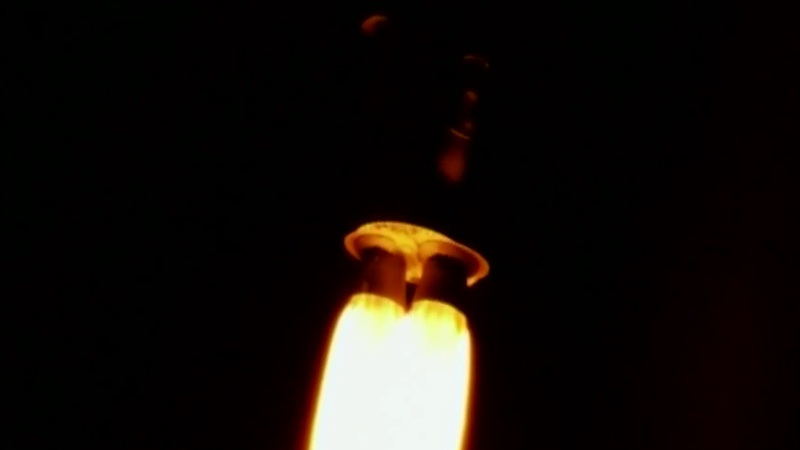 SBIRS GEO-3 was sent off 44 minutes after liftoff, embarking on nine days of orbit raising operations to join the first two satellites in Geostationary Orbit to get one step closer to finishing the deployment of the Space-Based Infrared System later this year. Friday’s Atlas V launch set a new record for the fastest launch campaign by the workhorse launcher – taking only 13 days from the arrival of the first stage at the launch complex to the rollout of the fully-assembled rocket. Continuing to streamline processing operations as Atlas V matures as a launch system, ULA can take advantage of the shorter on-pad time to provide more slots for missions in a calendar year. Eight Atlas V missions are on the manifest for 2017, though there are still open slots that could be contracted by commercial satellite operators through ULA’s RapidLaunch initiative. Most of Atlas V’s business this year will be in support of national security and Friday’s mission was no different – lofting into orbit a valuable space-based asset for the Department of Defense. 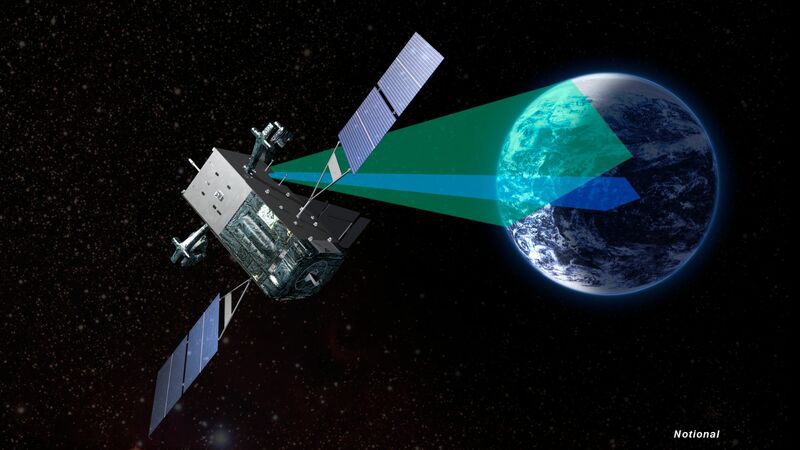 The Space-Based Infrared System, SBIRS for short, is a cornerstone of America’s space-based defense assets, designed to detect and track missile launches to provide advance warnings of any imminent threat to the United States, deployed armed forces and allied nations. It is a successor to the Defense Support Program that went through several generations of satellites launched between 1970 and 2007. SBIRS consists of dedicated satellites in Geostationary Orbit and hosted sensors in elliptical orbits which cover a blind spot of the GEO birds in the extreme northern regions. Friday’s payload is the third dedicated satellite, joining SBIRS-GEO satellites launched in 2011 and 2013, as well as three HEO sensors deployed on National Reconnaissance Office satellites launched in 2006, 08 and 14. The early detection of incoming missiles is essential when attempting to intercept the attack before it reaches its destination. Initial systems deployed in the 1950s relied on ground-based radar with a very limited range, providing only short warning lead times. As the utilization of space became possible, the United States initiated development of the Missile Defense Alarm System (MIDAS) that launched a number of satellites into Low Earth Orbit in the 60s, but failed to enter operational services as satellites either failed shortly after launch or never got into orbit. However, MIDAS was useful in demonstrating that the signatures of missiles could indeed be tracked from orbit. The Defense Support Program was inaugurated in 1970 and went through three satellite generations operated from Geostationary Orbit to provide global missile detection capabilities using sensors that swept out a large viewing sector on Earth as the satellites spun around their central axis. In the days of the Cold War, missile detection was focused on Intercontinental Ballistic Missiles while today, in a changing picture of worldwide security, short-range missile systems have become a real threat to deployed U.S. and allied forces – requiring ultra-sensitive sensors to pick up the faint-signatures of these types of missiles. The SBIRS Program was formally initiated in 1996 to respond to changing threats by developing an integrated system that can detect all types of missiles and cut warning times in half compared to the DSP-based system. Lockheed Martin is the prime contractor for the SBIRS-GEO satellites with Northrop Grumman in charge of development and production of the SBIRS infrared-sensing instruments. The SBIRS satellites are based on Lockheed’s popular A2100 satellite platform and each has a launch mass of around 4.5 metric tons, built for a 12-year service life. 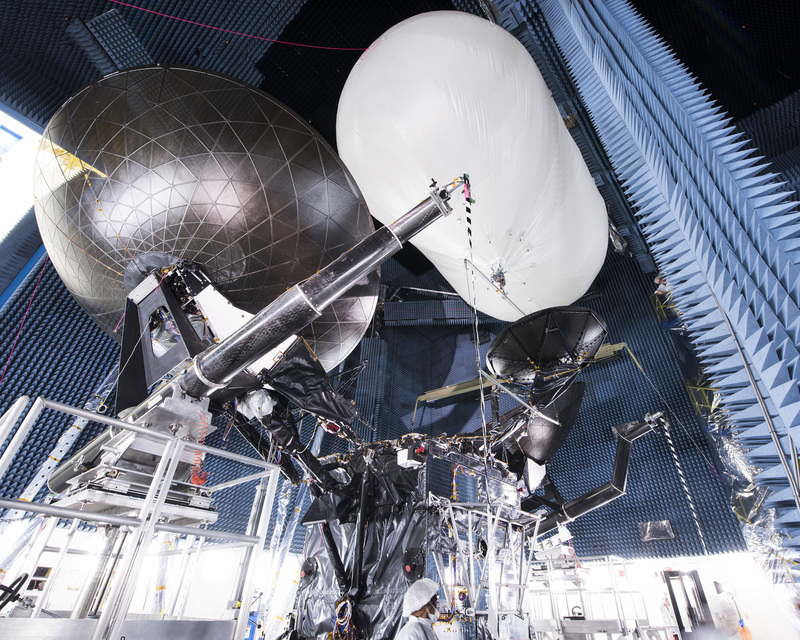 SBIRS satellites are outfitted with a pair of instruments – a scanning sensor and a staring sensor, both sensitive in three infrared bands in the short- and mid-wave range plus a see-to-ground channel. The scanning sensor progressively scans the entire visible disk of Earth to identify ICBM launches at fast revisit rate while the staring sensor can be kept focused on one or step between multiple areas of interest to spot faint & short-duration signatures from short-range missiles. SBIRS can also detect other infrared events such as wildfires, volcanic eruptions and space debris re-entering the atmosphere in a blaze of fire. 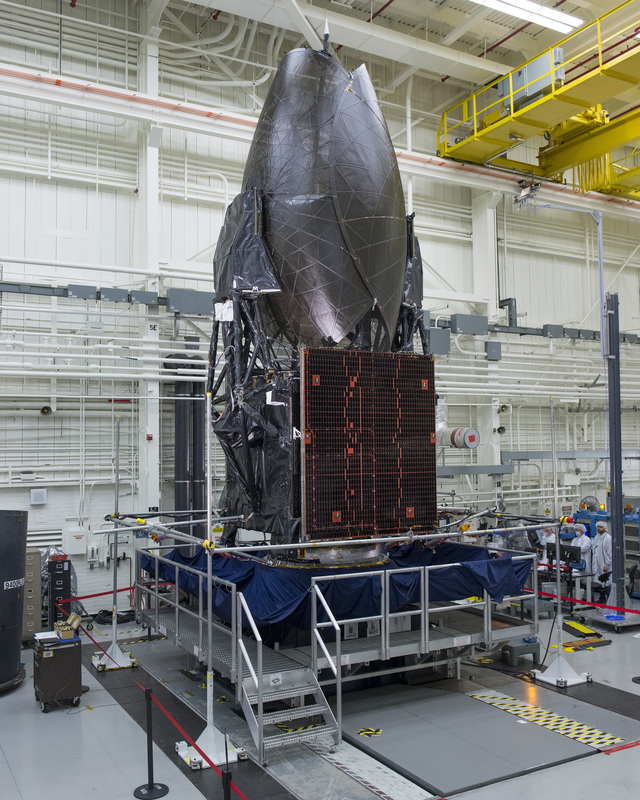 The SBIRS-GEO 3 satellite launched on Friday is actually the fourth SBIRS spacecraft produced by Lockheed Martin. The launch order was swapped to allow the spacecraft built as SV3 to remain in storage and have SV4 launch right after finishing assembly and testing – reducing cost by eliminating the need to swap the spacecraft in an out of storage. SV3 will launch as SBIRS-GEO 4 later in 2017 to complete the core SBIRS constellation. 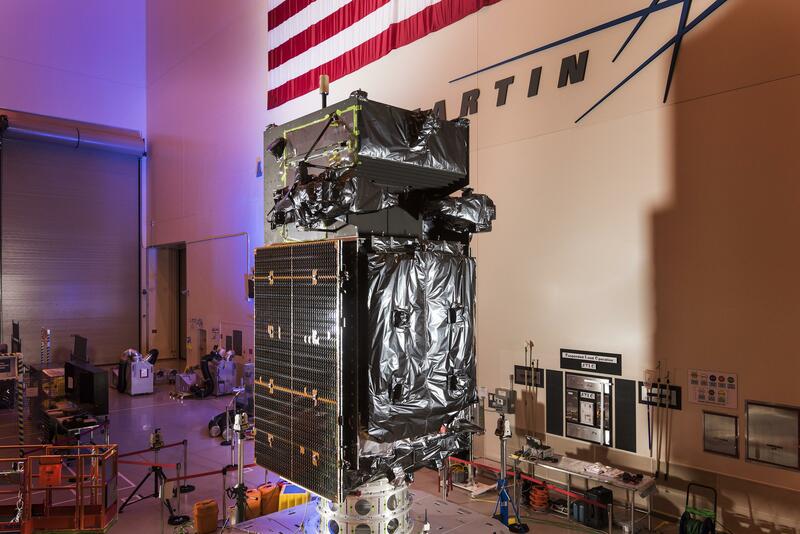 Given the importance of global missile detection and advance warning, the U.S. ordered another two SBIRS-GEO satellites from Lockheed Martin to ensure SBIRS-quality services can continue through the end of the next decade. Like its two predecessors, SBIRS-GEO 3 utilized the Atlas V rocket as launch vehicle. 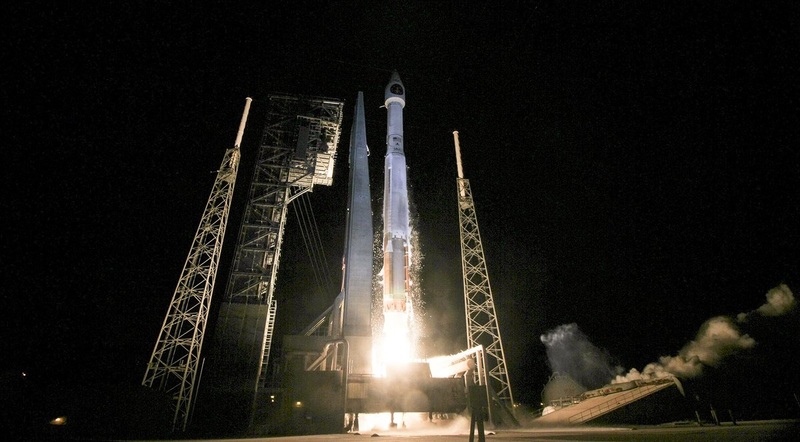 Designated AV-066, Atlas V flew in its basic 401 configuration comprised of a two-stage stack, a four-meter payload fairing and no Solid Rocket Boosters. It marked the 69th Atlas V launch since the rocket’s debut in 2002 and the 34th flying in the 401 configuration that, by far, remains the most flown version of the rocket. Rolled to its launch pad on Wednesday, Atlas V stood ready for liftoff Thursday night, but remained grounded after a technical snag pushed the launch time to the end of the window and the final attempt at picking up the countdown had to be halted due to a Customs aircraft violating the no-fly-zone around the Cape. Coming back after a disappointing delay, Atlas V was ready for another seven-hour countdown procedure to get ready for a nighttime liftoff on its year-opening mission. 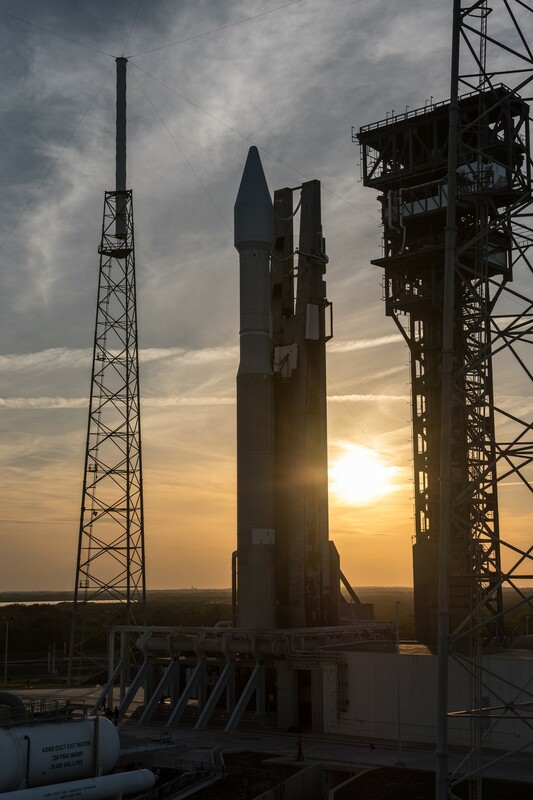 Following power-up of the two-stage rocket, teams put the Atlas V through a multi-hour testing campaign to exercise all critical subsystems while engineers buttoned up the launch facility to clear out in time for the busy propellant loading sequence. Coming out of a scheduled hold at T-2 hours, Atlas V entered its 90-minute propellant loading sequence. The first stage had received its dose of 94,600 liters of Rocket Propellant 1 fuel after Wednesday’s rollout, leaving only cryogenics to be loaded during the countdown as well as helium tank pressurization gas. The first stage received 185,000 liters of -183°C Liquid Oxygen while Centaur was filled with 15,700 liters of the supercold oxidizer plus 48,000 liters of even colder Liquid Hydrogen, stored at -253°C. Tanking was by the book and Atlas V went through a second round of systems checks before entering final flight system reconfigurations and flight software load. The countdown headed into a half-hour hold at the T-4-minute mark during which all tanks reached flight level and the SBIRS-GEO 3 satellite made its switchover to battery power with payload operators providing their final GO for launch to the launch team. With Atlas V standing fully fueled, illuminated by flood lights, teams went through a final Go/No Go poll to approve the 335-metric ton rocket to press into the highly choreographed countdown sequence. When clocks resumed ticking at T-4 minutes, Atlas V started a fast-paced series of steps to be transitioned to a fully autonomous launch configuration – securing the rocket’s propellant tanks, switching to internal power, arming the Flight Termination System and handing control over to the onboard launch sequencer that oversaw the final pressurization of tanks and the ignition of the two-chamber main engine. RD-180 rumbled to life three seconds before clocks reached zero, spinning up to a liftoff thrust of 390 metric-ton force under close observation by computers to ensure the booster reached operational conditions before being allowed to leave the ground. Atlas V rose from its launch mount at 0:42 UTC, gently departing the ground in the usual slow initial climb-out of the 401 version of the Atlas rocket, lacking the kick of Solid Rocket Boosters that catapult the rocket’s bigger sisters of the ground. 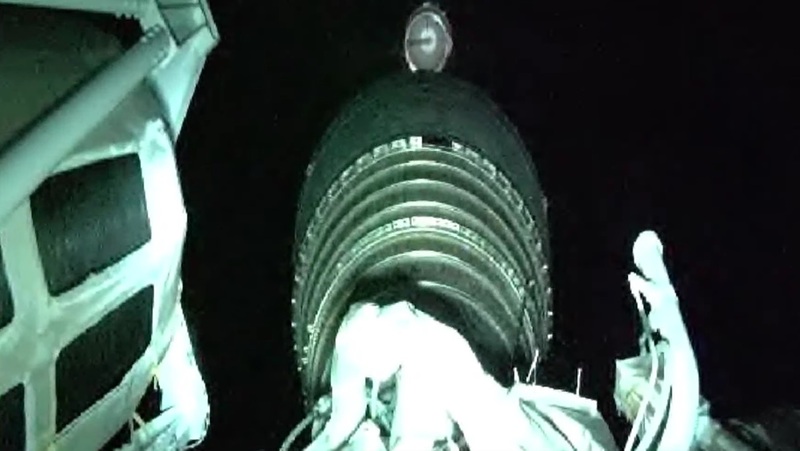 Gimbaling the two nozzles of its main engine, Atlas V balanced in a perfectly vertical posture for the first 18 seconds of the mission before the pitch & roll program kicked in to put the vehicle onto a 95.9-degree launch azimuth, departing the Cape to the east-south-east. Lighting up the dark skies over the Space Coast, Atlas V quickly powered uphill, passing Mach 1 after eighty seconds and encountering Maximum Dynamic Pressure ten seconds later. Burning 1,150 Kilograms of propellants per second, the first stage transitioned to closed loop control to dynamically adjust its flight profile after sticking to a fixed load-relief guidance profile for the initial portion of the mission when Atlas V was cutting through the dense layers of the atmosphere. While the first stage was still firing, Centaur prepared for its ignition by pressurizing the reaction control system and the RL-10C engine entered its final chilldown. Heading into the thinner layers of the atmosphere, thrust on the RD-180 increased to 422 metric ton force before the engine was commanded into a gradual throttle-back to limit acceleration on the vehicle to 5Gs in the final seconds of its burn. BECO – Booster Engine Cutoff – occurred four minutes and four seconds into the mission after what was characterized as nominal performance on the first stage – meeting its cutoff target well within predicted margins. Six seconds after BECO, the first stage was pyrotechnically separated and pulled away from the Centaur upper stage by firing eight small retrorockets. Upon separation from the booster, Centaur immediately purged its reaction control system and pre-started the RL-10C engine. Ignition of the RL-10C was confirmed at T+4 minutes and 20 seconds, soaring to 10,400 Kilogram-force of thrust to push the stack into orbit via a burn of eleven minutes and four seconds. Ten seconds into the operation of the second stage, the two halves of the payload fairing split open and separated from the ascending rocket, revealing the SBIRS-GEO 3 satellite as aerodynamic forces were no longer a danger to the delicate satellite structure. Centaur shut down its engine fifteen and a half minutes after launch, achieving an orbit of 175 by 1,230 Kilometers, inclined 26.8 degrees to either side of the equator. In this orbit, the upper stage was set for a coast phase of nine minutes and 37 seconds to continue flying to the south east, crossing the Atlantic and firing up again around the equator to that the high point of the injection orbit would also be located above the equator to ease the process of phasing the satellite into Geostationary Orbit. RL-10C was re-started right at the T+25-minute mark on a planned burn of 3 minutes and 38 seconds, aiming to deliver SBIRS-GEO 3 into a standard Geostationary Transfer Orbit of 185 by 35,786 Kilometers, inclined 23.29 degrees. Achieved orbital parameters at separation read 185.1 by 35,822 Kilometers at an inclination of 23.289 degrees – marking another on-target injection by the Atlas V launch system. After the conclusion of the propulsive mission phase, Atlas V again entered coast mode, flying passively for 15 minutes while crossing over sub-Saharan Africa and the island of Madagascar, entering the proper attitude for satellite release. 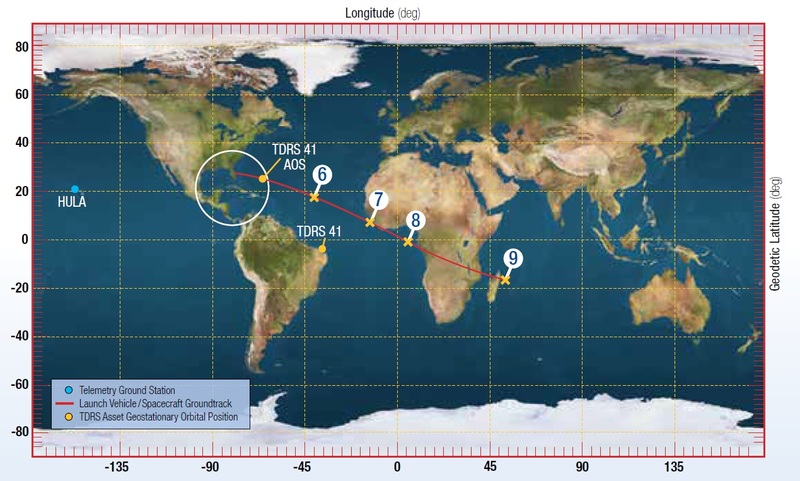 SBIRS-GEO 3 was sent on its way just shy of the T+44 minute mark over the Indian Ocean, just east of Madagascar – marking the successful completion of Friday night’s mission, ULA’s 116th launch success. Following separation from its launch vehicle, SBIRS-GEO 3 will begin a nine-day sequence with six firings of its Leros main engine to lift itself into Geostationary Orbit, nearly 36,000 Kilometers above the equator where the satellite’s speed matches the Earth’s rotation so that the spacecraft can remain locked over one location. 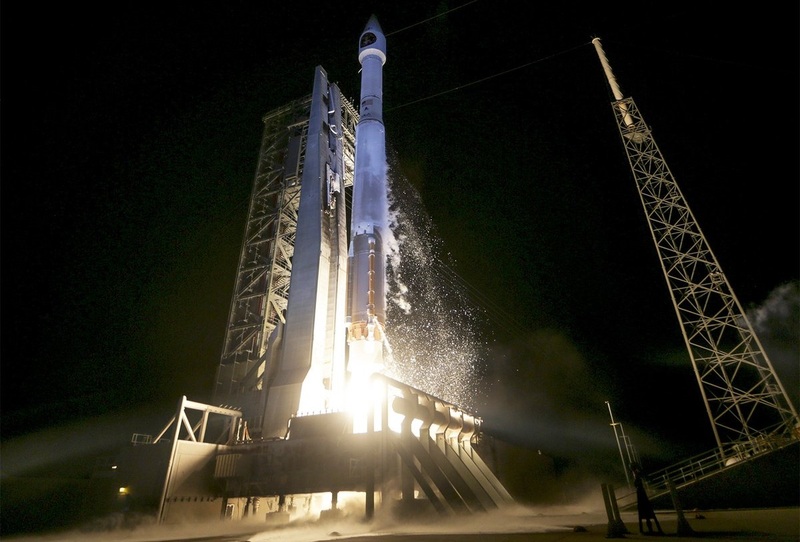 The Air Force did not disclose from where the new satellite will operate. 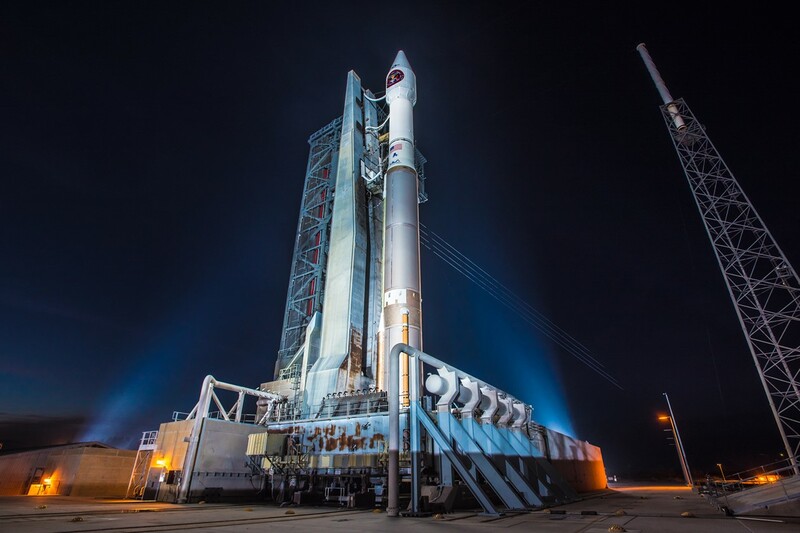 The next Atlas V mission recently slipped from a late January target to February 9 (UTC) due to an issue discovered on that rocket’s Centaur upper stage. Launching from California, Atlas V will be tasked with lifting the highly classified NROL-79 mission for the National Reconnaissance Office, believed to involve a pair of naval reconnaissance satellites. 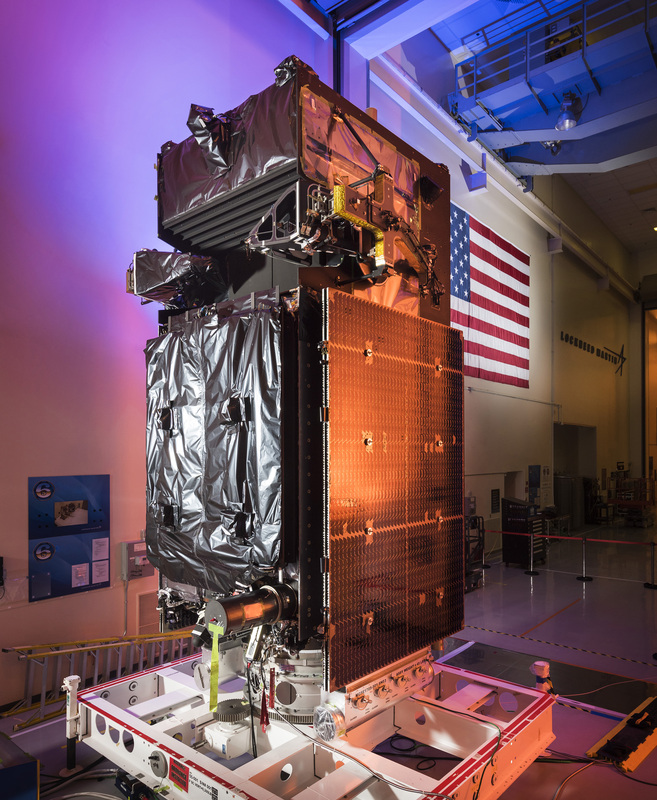 SBIRS-GEO 4 is currently aiming for launch atop an Atlas V in November and another HEO sensor for the program may be headed into orbit in June aboard the NROL-42 satellite. WhyCry, PARIKRAMA, GSLV Mk III and 2 others like this. 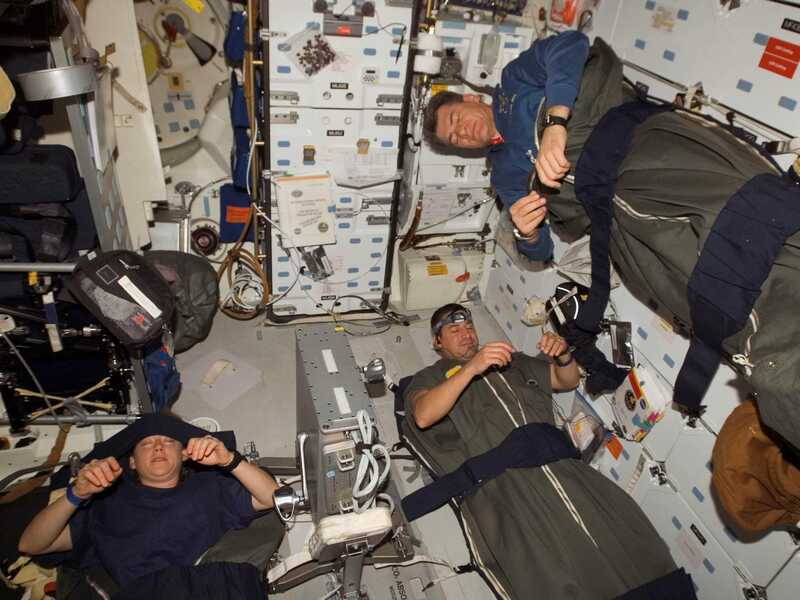 In space Astronauts keep to a rigid schedule designed to keep their circadian rhythms consistent (NASA's got a great module on the subject). 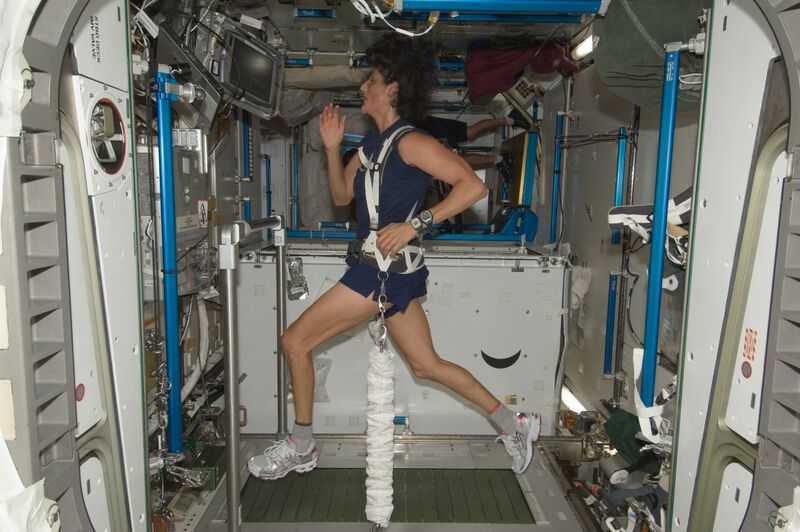 Sleep at certain periods, exercise, run experiments, dine, use their free time for communications with family or other personal activities (differs from person to person) it's all in accordance with a set schedule with the exception of unscheduled events like impact warnings, spacewalks or unscheduled repairs. floating in space, witnessing 15 dusk and dawns per day it's hard to maintain a sense of normal operations. In many ways their routine is the same as what we terrestrial people do everyday, it's just more regimented. 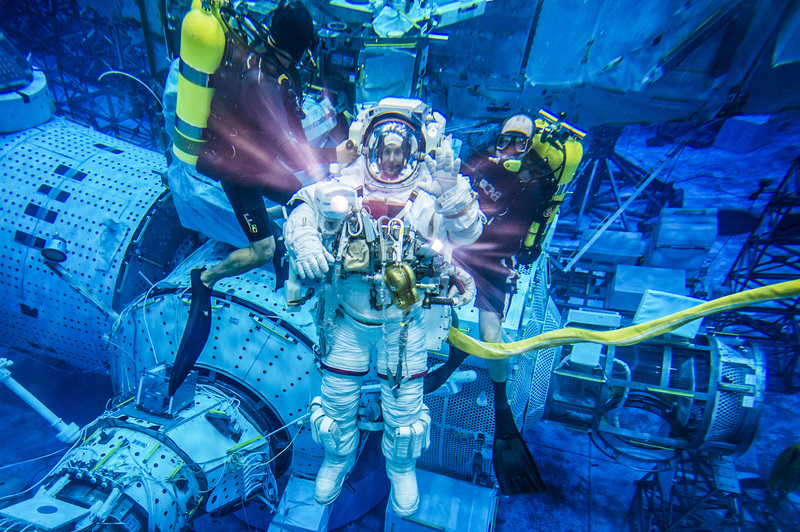 On land astronauts are constantly going over specifics, training, experimenting, training again and more training to keep them sharp and their skills honed. Some of their training is similar to what I underwent as a US Navy submariner. 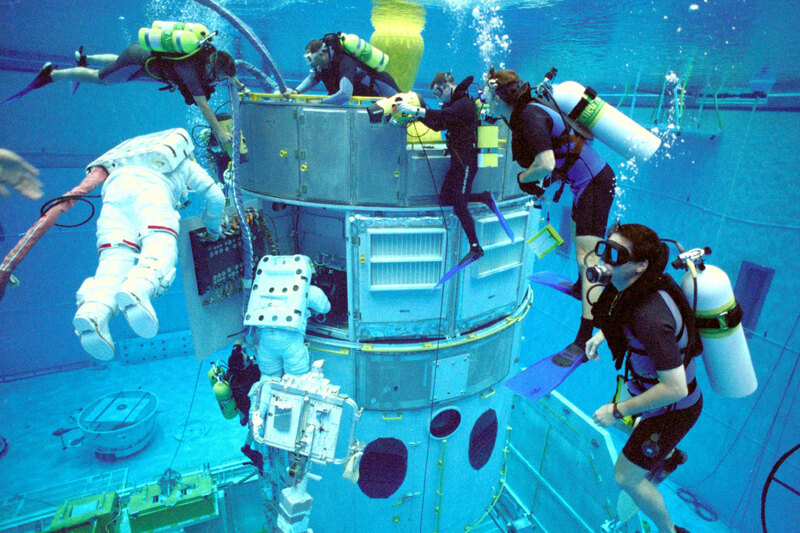 The Neutral Buoyancy Lab simulates the conditions an astronaut in space experiences, albeit underwater. 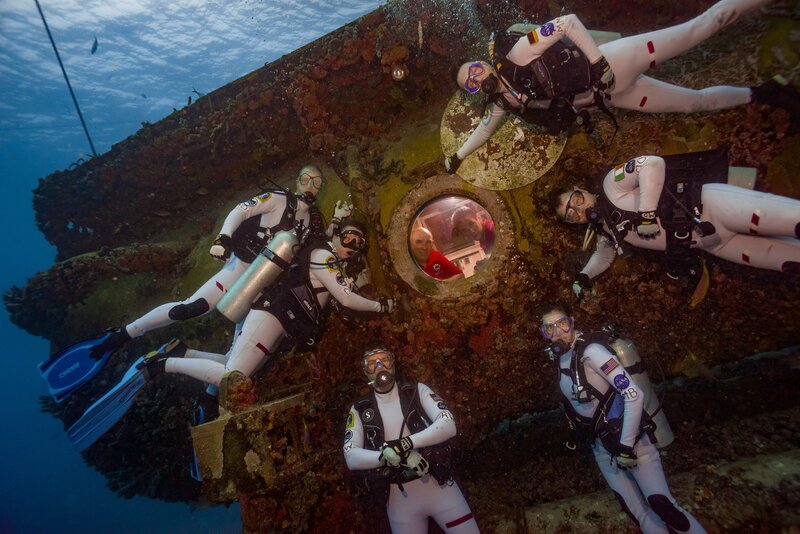 The NEEMO Aquarius in the Atlantic Ocean is another such facility hosting international partners. WhyCry, Dagger, PARIKRAMA and 2 others like this.